Many of the researchers who contact the Rush Archives ask us for a general history of the institution. 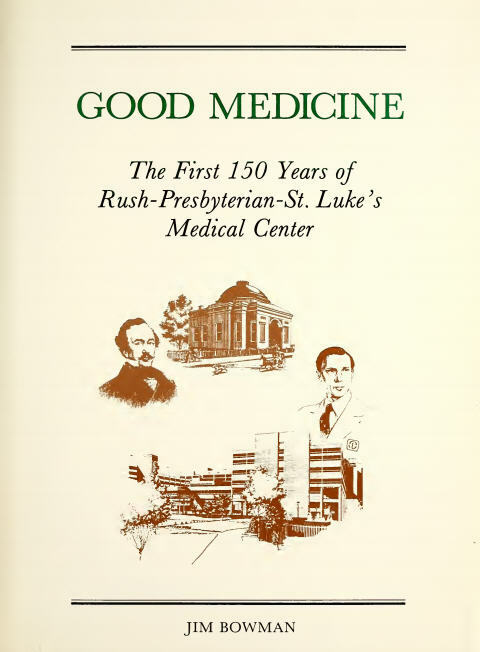 Good Medicine: The First 150 Years of Rush-Presbyterian-St. Luke’s Medical Center, is a solid history of Rush that includes historical photos and information from a variety of resources in the Rush Archives. Unfortunately, the book is now out of print, and it is difficult to obtain enough copies to meet demand. The Rush Archives is pleased to announce that Good Medicine is now available on the Internet Archive website for downloading or online viewing. Researchers can perform keyword searches of the text on the website or download the entire book in a variety of e-reader formats. Last September, the Rush Archives received a Book Digitization Initiative Grant from the Consortium of Academic and Research Libraries in Illinois. We created a collection of digital books from commonly requested works in our collections. In addition to Good Medicine, the Rush Archives page on the Internet Archive includes The Pulse Rush Medical College yearbooks from 1894 and 1895, two early alumni directories, and a variety of publications written by early Rush Medical College faculty. The Rush Archives will be submitting additional proposals for digitization of its book collections. If you have suggestions for Rush-related items that you would like to see digitized, please contact the Rush Archives at rush_archives@rush.edu.